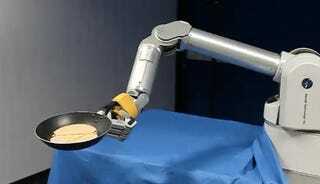 Here's a robot learning to flip pancakes. It's hard not to laugh, watching this dumb bot flub flip after flip. But we won't be laughing when we're running for our lives, slowed down by a stomach full of fluffy pancakes.